It has been nearly a week since the CREATE New Jersey retreat. I have had some time to get my hands dirty and incorporate some of what I learned into my own work. Before sharing, let me tell you about Julie Balzer's workshop in stamp carving. I "met" Julie through her blog, Balzer Designs, when I was first investigating the world of mixed media art, and particularly art journaling. I did Julie's "30 days in your journal" online class, and it definitely transformed my approach to making art. (The class is ongoing and self-paced, so you can take it anytime.) So I was excited to study with her in person. The coloration in the last one comes from one of the most exciting lessons from this workshop -- learning to make our own inkpads. Very cool. 1. I'm embracing my childhood nickname of "Messy Jessy." My mixed media style is a bit rough around the edges -- I don't like being confined to neat and pretty lines or having to have things line up precisely. Some of the women in the stamp carving class made the most gorgeous, intricate stamps -- but I liked it best when my lines were a bit more jagged and uneven. 2. Even though I don't love my handwriting, I like using it. Although there are great lettering stamps and fonts out there, I like when a sentiment looks like I wrote it -- even though the lettering might be uneven or messy at times. 3. I can't help but work in a triage zone! My work space inevitably looks like a hurricane blew through it, and that's ok with me. I like having all my supplies out where I can see them, and to me, it is controlled chaos even if I look like I'm completely disorganized! So even though I clean up after each project, I'm going to stop trying to have an organized workspace as I'm working. It just doesn't fit my style. Zentangler Dilip Patel has a lovely tradition of thanking the people who commented on his previous post. Because I am so grateful for people's comments, I am going to adopt this tradition. So big thank yous to Gloria, TangleWithLinda, Teddi, Lynn, Debbi, Diane, Natasha, Mary, Marjl, Lisa, Carolyn, Tracey, Anne, Candace, Pauline, Linda, Sabina, JKW, Giggles, Wednesday, Karen, IHannah and Ginny for leaving such kind comments on my last post. And finally, a shout out to Veronika, Erica, Sally, Ida, Lyria, Shari, Martha, Ruth and Sandra and all the other amazing women I "arted" with last week! I hope to see you again soon! UPDATE: I forgot to mention Carolyn Dube -- whose blog I have so admired -- and who I had the pleasure of taking a class and having lunch with! It was SO NICE to meet you. As always, your words mean the world to me! So if you are moved to comment, know it makes me very happy! Your purple stamped flower centers work so perfectly with that page! Your work shows you are a strong member of the mixed media world! Best lunch ever at an art class- and it had nothing to do with the food. I am so grateful that we were able to meet up! I love it! Sounds like a wonderful class and meeting (love Carolyn!) and that you had so much fun! 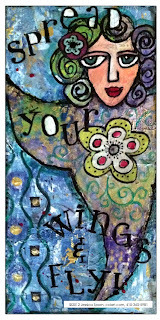 The art you created is fabulous and I love those carved stamps!